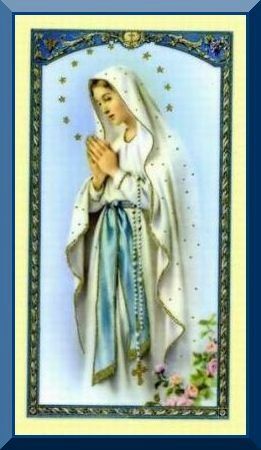 This Magnificat Holy Card is laminated & shows Mary on the front. The Magnificat Prayer is on the back. Text on Back: My soul doth magnify the Lord: And my spirit hath rejoiced in God my Saviour. Because He hath regarded the lowliness of His handmaid. For, behold, from henceforth all generations shall call me blessed. For He that is mighty hath done great things to me, and holy is His Name. And His mercy is from generation unto generations, to them that fear Him. He hath showed might with His arms. He hath scattered the proud in the conceit of their heart. 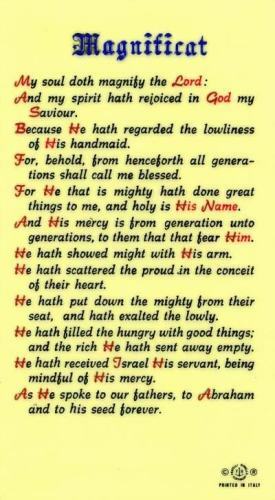 He hath put down the mighty from their seat, and hath exalted the lowly. He hath filled the hungry with good things. and the rich He hath sent away empty. He hath received Israel His servant, being mindful of His mercy. As He spoke to our fathers, to Abraham and to his seed forever.